How fun is a bike ride? 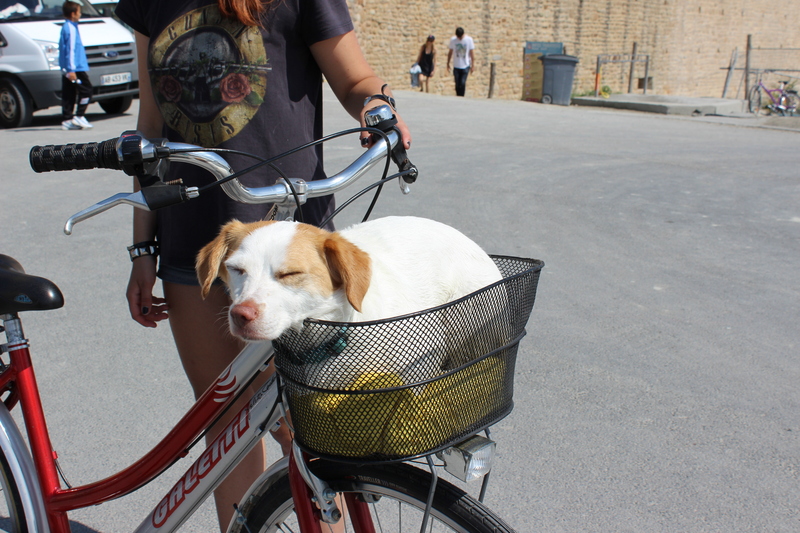 Further, how fun is a bike ride with your dog? Alright, now how about a Central Oregon Bike Ride on winding trails through the trees with your dog? Nothing better, right? Okay, okay, maybe your dog SHOULD be running alongside your bike…getting (ehem…) exercise? Most dogs would. But this dog is a bit, well, lazy? Sleepy? Maybe he just had lunch and needed a siesta. So he got a little slow on the trail and needed a nap. Yeah, that’s it. A bike, a basket, a nap. Fresh air, winding trails through the trees. Perfect. 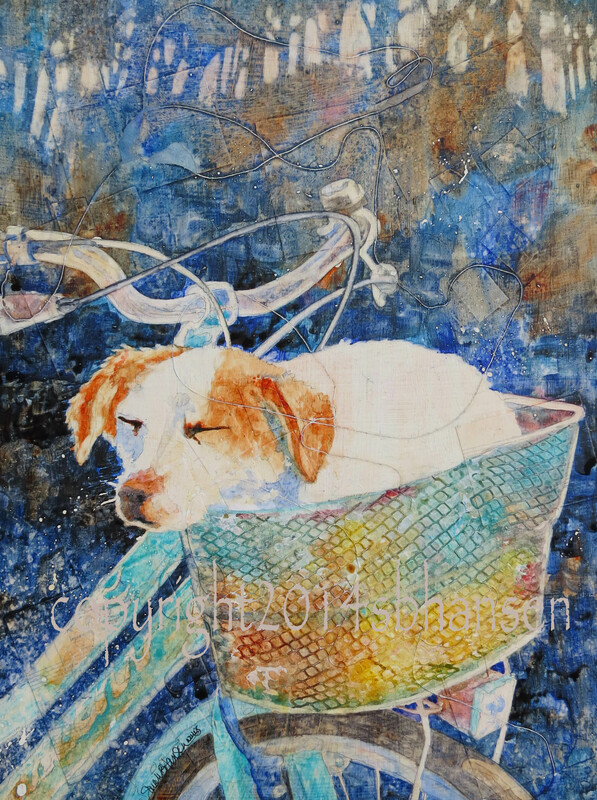 To create the texture of the wire basket, I placed plastic netting directly into a thick application of wet gesso. 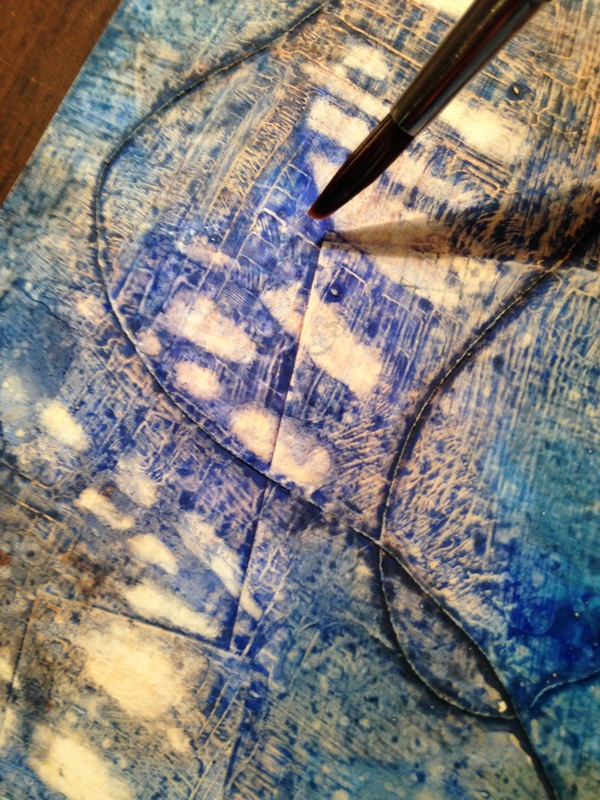 Once dry, I loaded a saturated mixture of watercolor into the netting. After it all dried, I carefully pulled up the netting and voila! Cool texture for the basket! 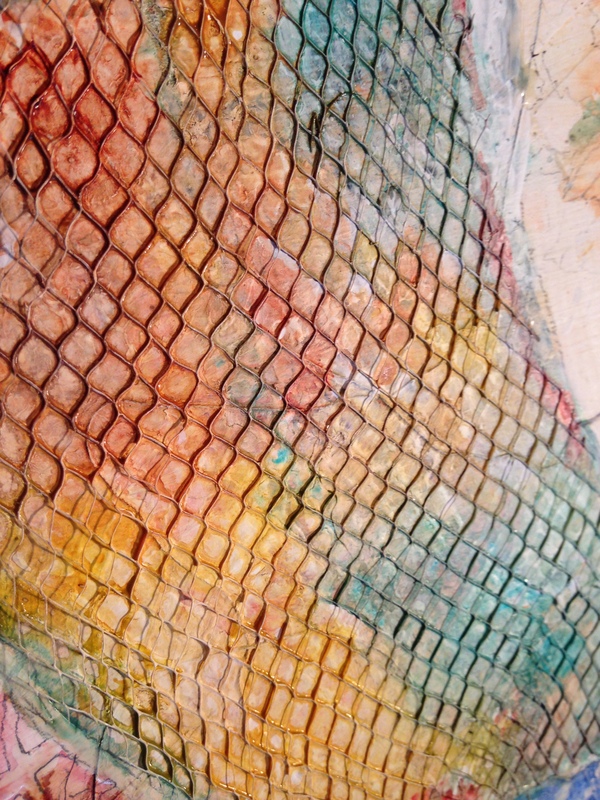 Netting placed into the painting to create texture. In preparing the surface for the painting, I adhered a string to it, loosely wandering through the canvas, as well as squares of paper, creating a texture and chaos. To further create an interesting background, I combined several different blues directly on the canvas and fed the colors all the way up to the top of the painting. It seemed to lack depth, so I added a rolling forest of trees in the background by removing blue with clear water to create negative spaces behind the trees. Pulling out the negative space to add the illusion of trees to the background. I had used liquid mask on the brake wires near the bike handles and a few other areas to preserve whites, easily painting through it and the string, without breaking the continuing color and value. Detail showing the string and the bike wires, which are preserved with liquid mask. After finishing up the dog, removing the liquid mask, and adding detail, I surveyed the painting for a couple of days. I decided I didn’t like the dark value of the string. I had to remove it. YIKES! Removing the string could cause damage to the surface of the painting and ruin areas I had finished. BUT! I couldn’t live with it as it was, so, taking a deep breath and an exacto knife, I tugged an end and released it from it’s gesso prison. Hallelujah! It worked! 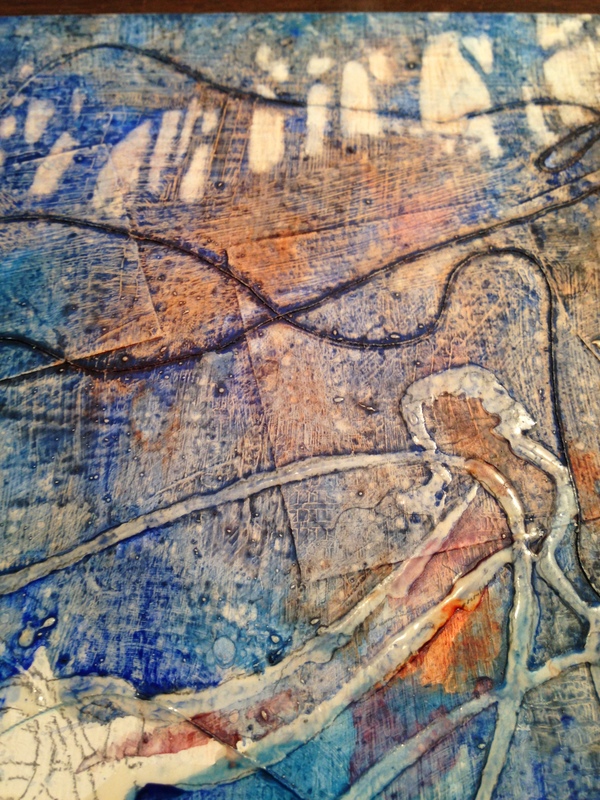 The string left a white line through the painting, connecting other white elements and symbolizing the winding bike trails in Central Oregon. Love it!! To purchase, send me an comment. I accept PayPal and will email a PayPal invoice.